Going beyond the typical "how to write" book, The Mindful Writer illuminates the creative process: where writing and creativity originate, how mindfulness plays into work, how to cultivate good writing habits, how to grow as a writer and a person, and what it means to live a life dedicated to the craft of writing. There's not a writer alive, novice or master, who will not benefit from this book and fall in love with it. Cover to cover, this wise little book is riveting and delightful. The Mindful Writer will be a book that readers will turn to again and again as a source inspiration, guidance, and support. 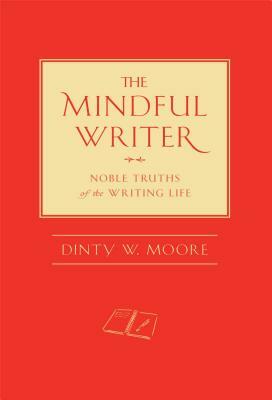 Dinty W. Moore is author of The Mindful Writer: Noble Truths of the Writing Life, as well as the memoir Between Panic and Desire, winner of the Grub Street Nonfiction Book Prize in 2009. Moore has published essays and stories in The Southern Review, The Georgia Review, Harpers, The New York Times Sunday Magazine, The Philadelphia Inquirer Magazine, Iron Horse Literary Review, and Crazyhorse, among numerous other venues. A professor of nonfiction writing at Ohio University, Moore lives in Athens, Ohio, where he grows heirloom tomatoes and edible dandelions. I recommend this book to anyone interested in the written word.” -Lin Jensen, author of Deep Down Things, Pavement, and Bad Dog!